The saturation of colour in the clematis is incredible, you are always able to invent an interesting way of arranging your blooms, I like the space left around the flowers in your vase. Thanks for noticing the space. I was trying for a very open arrangement, but they needed to touch a bit to help with the support. The clematis is attractive at this stage. I read to cut at the 1/2 or 3/4 open stage. Outdoors in the sun the color fades once they’re completely open. Thanks! You can tell I favor the blues and purples. Those colours go so well together and with the white background your vase looks stunning! Less is certainly more in this case – just two blooms focuses the eye and I am sure grabs your attention more than a whole bunch would. Thanks Cathy. Neither flower wanted to stand up straight and cooperate but we’ll enjoy them in the house this week. I saw an entire bridal bouquet online of clematis that looks terrific, but I don’t know the trick for working with them. Judy, glad to bring a little bit of spring your way. We’ve had rain recently and I see dark clouds forming again. The two flowers complement each other well, Susie. The rocks, in addition to serving as support, add to the austere beauty of the arrangement. Thanks Kris. I love using those black stones. They are visual and tactile elements I find very appealing. 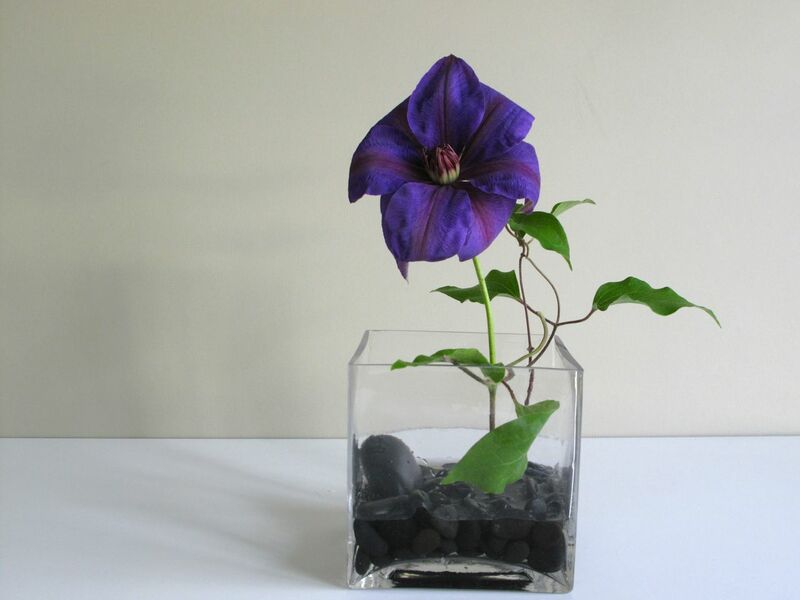 You greatly inspired me Susie….I had not thought of clematis, but will try it once they bloom…they are just breaking bud now here….love the purples and simple elegance of the vase. Thank you Donna. 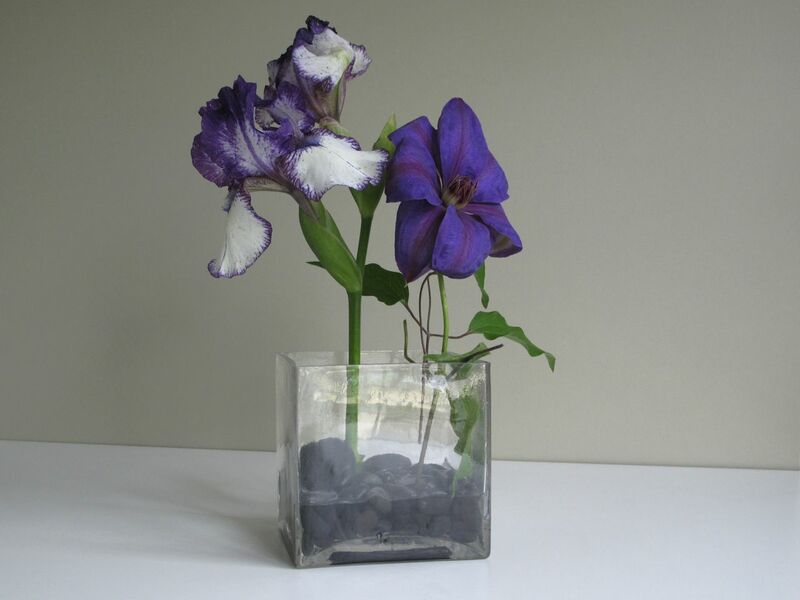 I’ll be curious how you like working with clematis in a vase when the time comes. My favorite colors so I very much agree. Oh wow, Susie! 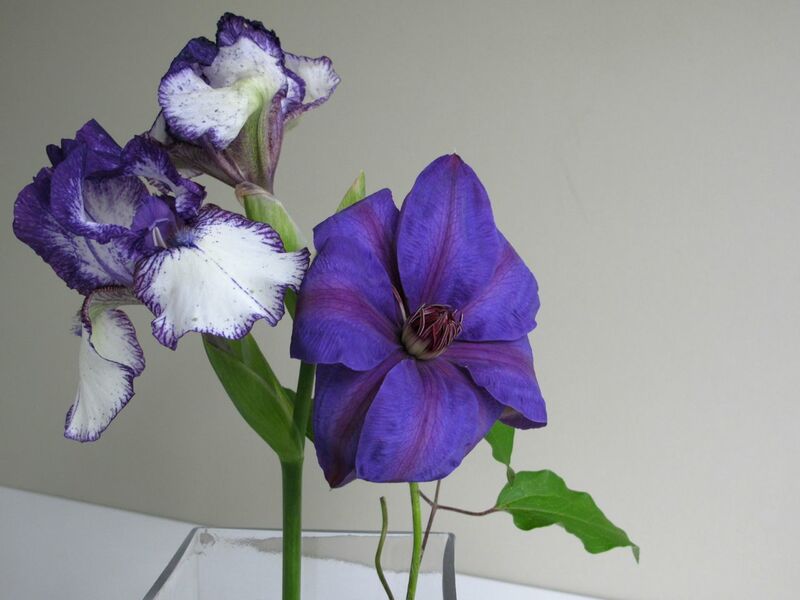 It doesn’t need any more than single blooms – they complement each other perfectly and I can see we will all be using more clematis in our vases this year. The shading on the iris is stupendous – it would be a shame to miss some of this perfection by not checking our gardens several times a day. Thanks so much for sharing. I went for simplicity this week Cathy. 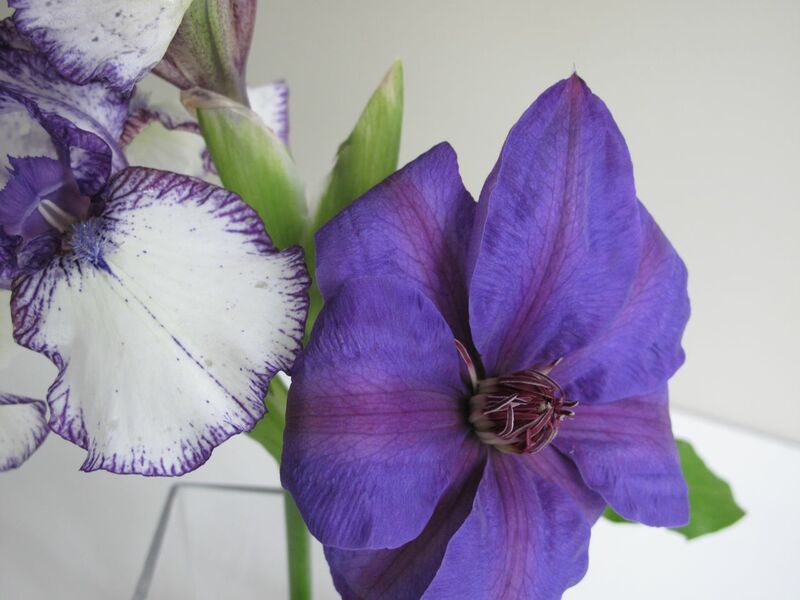 The clematis and iris are so richly hued and heavily patterned they can hold the attention without much else. 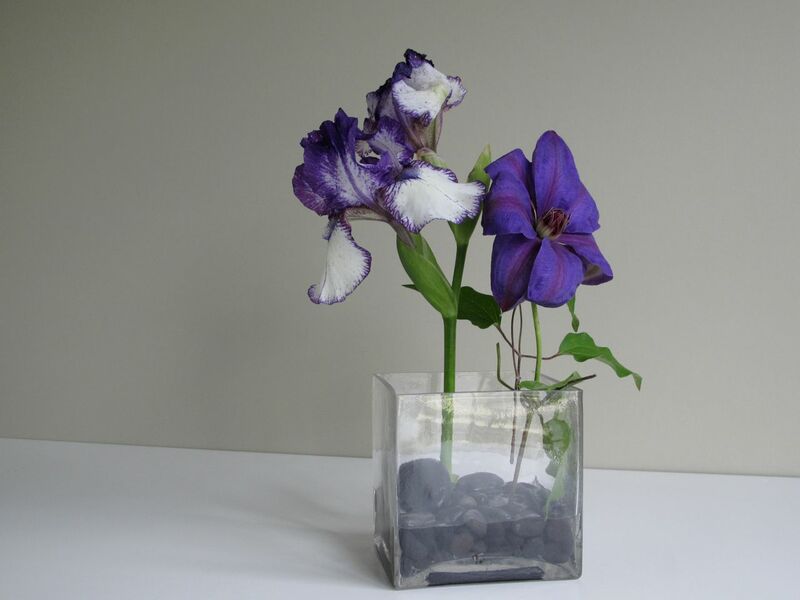 I’ll look forward to seeing clematis in Monday vases (seems like you may have before). 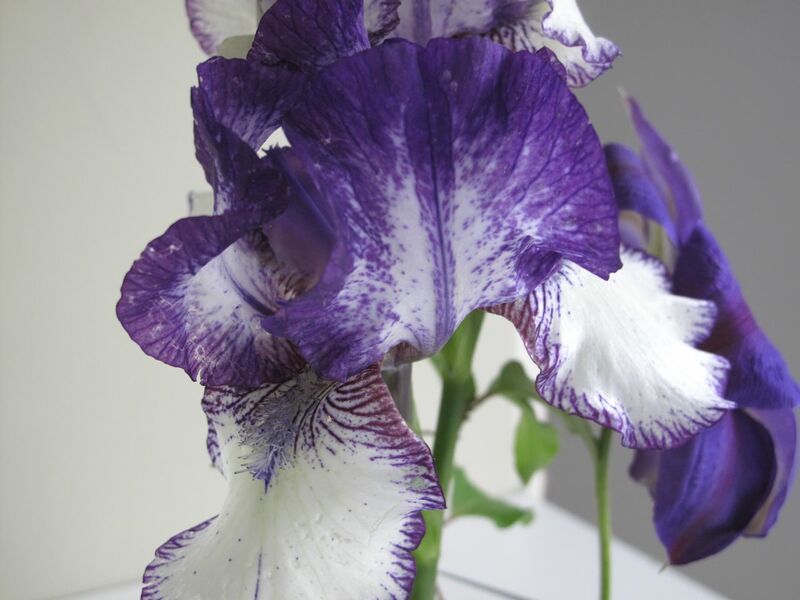 True, once again – less is more with two noble flowers and a colour to remember.Thanks for sharing your vase, Susie! Thanks Anca. Noble, yes, that’s a good word for these two. I love your vase today Susie, great presentation and very, very stylish. Thanks Julie. It’s growing on me. Hope you’re doing well and enjoying spring. Looks like we are running neck and neck with items opening right now. It is, indeed, a very changing garden right now. We just had a hailstorm this afternoon. Haven’t been out to inspect but can’t imagine the flowers liked that. It’s so interesting to see the difference in your garden “season” and mine…my clematis isn’t near flowering. And I have just two iris that have come out. Actually, my Louisiana Iris are coming along faster than any others, much to my surprise. I’ll post some on Instagram later this evening! Gorgeous colors Susie! The garden seemed to speed up last week. I planted the dahlia you gave me last fall and it had a bit of growth on it so I am optimistic it will make it. The royal blue of your iris and clematis is spectacular. I’ve never seen such a vibrant and rich blue before! And I’ve certainly not seen an iris with that coloring. In the gardens around Central Texas, we have plenty of purple, yellow, pink and white irises… but none so striking as this one. Hi Rebecca. Thanks for commenting today. Here’s another photo of the iris that was taken outdoors. You can see the color is very deep before it opens. Blues and purples are my favorite flower colors and how lucky you are to have those bluebonnets. Never saw Clematis as a cut flower. Mine will not flower into June. Jason, clematis is apparently very popular as a cut flower (who knew? ), but mine is not holding up very well. Maybe it needs to be conditioned better to last. Simplicity is hard…and you have mastered it! Beautiful flower and I adore the vase!! Thanks very much Bernice. Both the irises and clematis have been nice this spring.